Now that the Duck Attack! 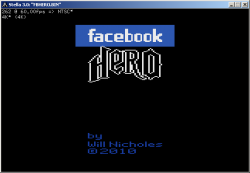 development work is done, I figured this would be a good time to announce my second official 2600 homebrew project: Facebook Hero. - Comment "I am so sorry!" It's a timed game: you start off with 20 friends, and the goal is to see how many friends you have at the end of two minutes. If you comment inappropriately (for example, responding "LOL" to "My grandfather is in the hospital" instead of "I am so sorry! "), you will be defriended and your friend count will drop by one. If a certain number of statuses pass by without you commenting (or "liking"), that person will think you don't like them and will defriend you. On the other hand, if you're able to keep up and respond appropriately, friends of your friends will friend you, increasing your friend count, i.e. your score. But the more friends you have, the faster the statuses will come, and the quicker you'll have to be with the joystick to keep up. Attached is a shot of the title page. No binaries yet; it will probably be a while before it's ready to test. I'm LOLing just thinking about it. Although I'm not sure I could play it for more than a couple of weeks, without getting fed up and unsubscribing. See, this will give you excellent practice "like"ing other people's dinners so you can jump back in there with mad Facebookin' skillz! i like this idea, i also just tried out Duck Attack for the first time and wow (i should probably go to that thread though). and i see new stuff in the AA store. today just has WIN written all over it. 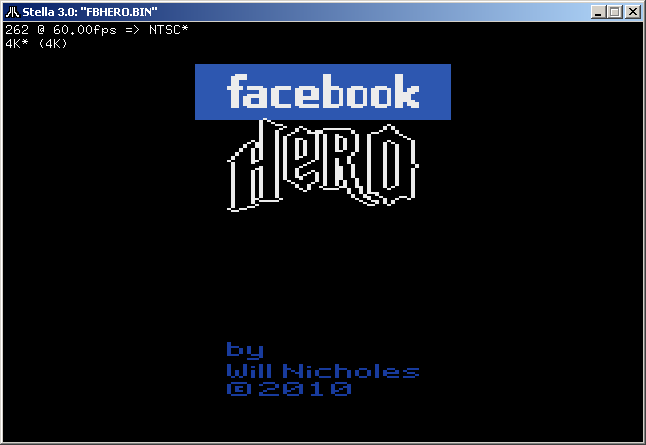 anyway, back to facebook hero. i was thinking how this could translate to the 2600, and the best solution i thought of (in case you haven't finalized your idea) was to have random messages scroll up from the the bottom of the screen and disappear at the top, with maybe an ON and OFF indicator line on the screen that tells players when to enter the command. they would have to do it after the ON line and before the OFF line. then, as the game gets tougher, these two guide lines get closer and closer to each other until they almost meet in the center of the screen giving the player a tiny window (literally) to time their responses to the random status message. ...or maybe time-based like you said. one message pops up at a time, and perhaps the player has to go through X amount in a given time to clear a level. any more than X are "bonus friends"...and...yeah i'll leave the thinking up to you. oh, and you have GOT to add a "dislike" option since facebook themselves won't.